The GALAXY S4, Samsung Electronics’ latest flagship smartphone unveiled at Samsung Unpacked 2013, is designed to get users closer to what matters in life and bring their world together. Long before it was unveiled, in spectacular fashion at Radio City Music Hall in New York, interest was brewing around the globe. 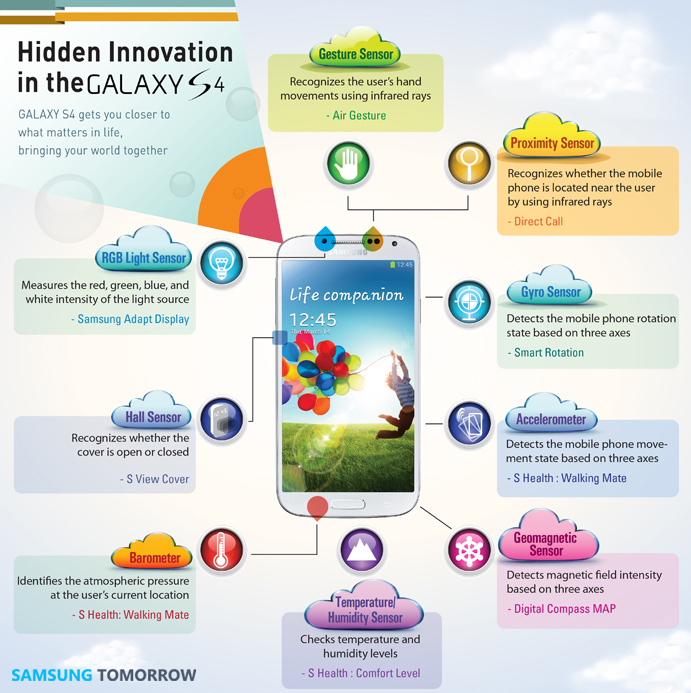 Now that the GALAXY S4 has been released, let’s take a closer look at some of the truly innovative features it has to offer. True innovation involves giving more meaning and comfort to the lives of users through new technologies. This is the unyielding philosophy that enabled the creation of the GALAXY S4. Initially, users may be fascinated with the GALAXY S4’s larger screen and battery capacity, all housed in a light and slim body, but as they learn more about the smartphone’s features it becomes clear that innovative elements were reflected not only in the hardware, but also the GALAXY S4 features some truly dazzling sensor and recognition technologies. The GALAXY S4 has seamlessly combined nine sensors and a wide array of recognition technologies that understand user behavior, thus delivering an effortless user experience, making things convenient and hassle-free. This goes beyond simple functions like making phone calls and running applications; users can focus on themselves and loved ones, with the GALAXY S4 working with them to strip away the complications of life. Samsung is committed to creating innovative products inspired by people, for people. Each innovative feature of GALAXY S4 was developed from the insights and needs we found from our consumers all around the world. This is especially true of our dedication to our customers’ wellbeing. The S Health function of the GALAXY S4 enables the smartphone to work with the user, providing an all-in-one companion that offers nothing but positive support. Below are just some of the features that aid users. The temperature/humidity sensor, a new addition to the GALAXY S4, identifies temperature and humidity levels in the surrounding environment through a small hole located at the base of the smartphone. It then visually displays what the optimal comfort levels are for the user on the S Health screen. The accelerometer measures the smartphone’s movement and is used as a Walking Mate, serving as a passometer that counts the number of steps a user has taken. The barometer ascertains the atmospheric pressure of a user’s current location and determines the altitude. This is especially handy when the user is walking on inclined planes, such as a hill or mountain, because the barometer can accurately calculate how many calories are burned according to the atmosphere pressure and altitude. The RGB Sensor, located on the top-left of the screen, measures the intensity of the light and is applied to the Samsung Adapt Display, which optimizes screen brightness and sharpness. As a result, eye fatigue is reduced when the user reads e-books or enjoys diverse applications. The planning phase of the GALAXY S4 was no easy task, and much thought was put into creating an effortless and more meaningful user experience. The results are plain to see, and so well-designed you may not even notice. So just in case, we’ll give you a quick summary. A number of sensors are featured in the GALAXY S4; sensors that are smart enough to detect a user’s face, voice and motion, enable screen control with no need for finger touch activation, and deliver effortless tasking. To begin, the two sensors located next to the front camera are used for gesture and proximity sensing. The gesture sensor recognizes hand movements by detecting infrared rays that are reflected from the user’s palm. This sensor was applied to the Air Gesture function of the GALAXY S4, allowing users to accept a call, change songs, or scroll a web page up and down all with a wave of their hand. The camera-based face recognition technology is used for Samsung Smart Pause, which pauses a video when the user looks away and resumes when the user returns, and Samsung Smart Scroll, which allows the user to scroll up and down without touching the screen. Samsung Smart Scroll is actually an outcome of the seamless application of two technologies. The first is face recognition technology, which recognizes a user’s face when he or she looks at the screen and allows the user to tilt his or her face up and down to scroll the screen. Additionally, users can conveniently scroll the screen up and down by tilting the smartphone. This is possible because of the gyro sensor, which recognizes the inclination of the smartphone. Air View allows the user to preview the content of an email, S Planner, image gallery or video without having to open it, just by hovering their finger over the item. It works thanks to Finger Hovering technology activated by measuring electric currents that change when the user’s hand is in close proximity to the touch screen. First debuted with GALAXY Note II, this is the first time the technology can be used without an S Pen. Voice recognition technology was adopted for the S Translator and S Voice Drive. For the GPS that is activated by voice based on S Voice Drive, a geomagnetic sensor is used for precise bearing determination. Finally, the Samsung Optical Reader uses Optical Character Reader (OCR) technology to recognize text and automatically recognizes information using the camera including e-mail, website addresses, telephone numbers, and QR codes. It then suggests useful follow-up functions such as translation, search, text message, email and call. If all this extra power has you concerned about battery life, fear not. The GALAXY S4 has a Micro Controller Unit (MCU) that activates the Application Processor (AP) only when needed and makes it possible to control the sensors without activating AP. As a result, the power consumption of GALAXY S4 is optimized, letting you enjoy these features longer. Even when the same-version of Android OS is used, there is a difference in battery performance among manufacturers dependent on the degree of software operation optimization. Despite the inclusion of various sensors, the GALAXY S 4’s power consumption has been optimized using Samsung Electronics’ unique technologies and expertise. Samsung wanted to create something different – something that would bring about change to a person’s life in a meaningful way. The GALAXY S4 is designed to get users closer to what matters most in life and bring all their different busy worlds together, so that they can experience life without boundaries or limitations. The GALAXY S4 features many diverse innovative functions that work subtly in the background to benefit users as they go about their daily lives. Anticipated to serve as a life companion to many people all across the globe, the GALAXY S4 was launched on 327 carriers in about 155 countries.